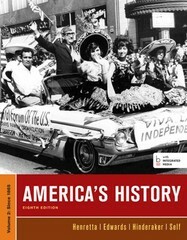 America's History, Volume II 8 Edition Help your students think historicallyKnown for its interpretive voice and thoughtful analysis, America's History models exactly the kind of thinking and writing students need to be successful. An accessible and balanced narrative with built-in primary sources and skills-based pedagogy gives students practice in thinking historically, and features new ways of mastering the content so that students come to class prepared. The eighth edition rolls out Bedford/St. Martin's new digital history tools, including LearningCurve, an adaptive quizzing engine that garners over a 90% student satisfaction rate, and LaunchPad, the all new interactive e-book and course space that puts high quality easy-to-use assessment at your fingertips. Easy to integrate into your campus LMS, and featuring video, additional primary sources, a wealth of adaptive and summative quizzing, and more, LaunchPad cements student understanding of the text while helping them make progress toward learning outcomes. It's the best content joined up with the best technology.